Fiat Chrysler launched the Jeep brand in India last year. The expensive price tag of the SUVs attracted a lot of flak, but soon Jeep announced that the company is working on two made-in-India Jeep models, one of which will be launched this year. The first affordable Jeep – the Compass, will soon reach India. Here’s all you need to know about India’s most affordable Jeep in five points. The price of the Jeep Compass will start from between Rs. 20 lakh to Rs 25 lakh. Unlike earlier, where Compass was thought to be an XUV 500 competitor, the new position of the vehicle will be against the likes of Tucson, and the base variants of Ford Endeavour. Even though Compass will be priced bit higher than expected earlier, it still will be the cheapest Jeep in India. Jeep will manufacture the vehicle at the Ranjangoan plant, and the ex-showroom price is likely to stay under Rs. 25 lakh. The bookings have not been started yet but soon FCA will open the bookings at its showrooms. The Jeep Compass will be launched in May-June. Fiat’s Ranjangoan plant is getting ready for the production of the Jeep’s latest model. The model will also be exported from India. The Jeep Compass will not remain the cheapest Jeep product for long in India. The platform of Compass will also form the base of another smaller Jeep, that will be similar to the Renegade. The new model will target vehicles like Creta and Duster in India and will be launched in late 2018. Till then, the Compass will enjoy the tag of most affordable Jeep in India. The new Compass will be powered by a 2.0-litre diesel engine in India. The 4-cylinder engine will get 140 BHP of maximum power with 350 Nm of torque. Jeep may also launch the petrol 2.0-litre engine that churns out a maximum of 160 BHP and 145 Nm of torque. The Compass gets monocoque body and fully independent suspension system that will make it an excellent off-road vehicle. 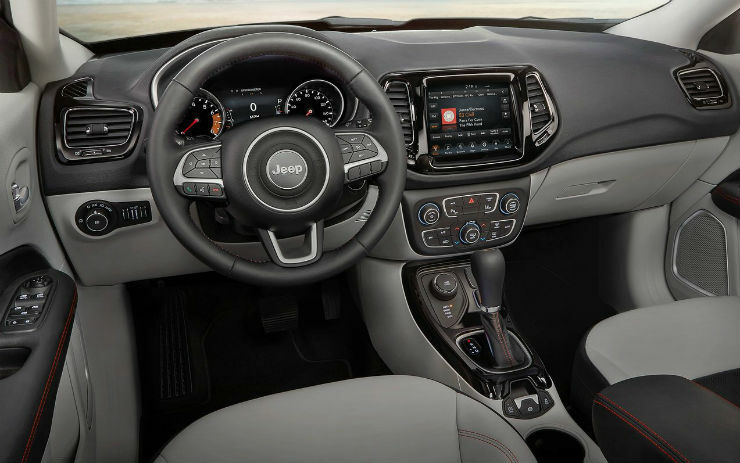 The car will also get U-Connect infotainment system that gets Android Auto and Apple CarPlay connectivity. There will be six airbags, and other safety features including ABS, ESP, Hill Hold, reverse parking sensors with camera and more.